A secret government agency has developed a drug called Revive that can bring people back from the dead, and Daisy Appleby, a test subject, has been Revived five times in fifteen years. Daisy takes extraordinary risks, knowing that she can beat death, but each new death also means a new name, a new city, and a new life. When she meets Matt McKean, Daisy begins to question the moral implications of Revive, and as she discovers the agency's true goals, she realizes she's at the center of something much larger -- and more sinister -- than she ever imagined. 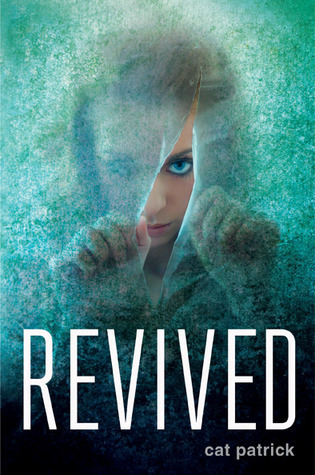 Review: I am a fan of science fiction, I wish there were more YA books that had sci-fi themes so when I find one I get really excited, so needless to say I was excited to read Revived. The premise of Revived really interested me.I want to work in the medical field so a drug that lets people come back from the dead really interested me. Daisy was a very interesting character, she, unlike many of the other bus crash survivors, knows a lot about revive, how it works ect, She is also very careless which kind of annoyed me because Revive would cost a lot of money and risking herself is careless and dumb. I did like how Daisy grew, she learned the value of a human life and that is really the thing that makes her look into the Revive program. While she is looking into it she finds somethings but I wish the author had gone into greater detail, but I know that would have been boring for some other readers. Matt and Audrey were very integral characters. I liked how they had their own story to tell and weren't just background in Daisy's story. I'm not going to lie, the ending while shocking was not completely out of the blue. I saw signs, but in some ways I appreciated that, it made it feel like the author knew what she was going to do before the end of the book. Overall I liked this book but I wish it had, had a little more of the science fiction aspects that I was looking for when I picked it up.